We had a reasonably short drive to get to Whitehorse for our next stop. Whitehorse is the largest city in Yukon and has plenty of places for shopping so is a great place for us to refill our cupboards, catch up with laundry and necessary repairs. To get to Whitehorse, we follow Hwy 1, the Alaska Highway from Haines Junction, where we spent last night. We made a couple of sightseeing stops, one of which was to see an old bridge. This old bridge does not meet today’s standards in spite of the restoration that has been done over the years, but the history lives on. It was originally built in 1903 when the gold rush hit the Kluane County and a route across the creek was needed. It was rebuilt during construction of the Alaska Highway in 1942 and was described as the most important bridge built by the US Army Corps so was left in place when a permanent bridge was built downriver. We arrive early afternoon and set up camp at the Hi Country RV Park, a busy and well equipped park to stay in. We’d stayed here before and would have one more visit again before leaving our Northern Adventure. This is our second visit to the city of 28,000 people. Being the capital, it is a busy center for government offices but also a very busy city for locals and visitors. We enjoyed our walk downtown where most of the storefronts take us back to the historical early days of the city. A visit to Whitehorse would not be complete without a tour of the SS Klondike. This sternwheeler was actually the second Klondike. The first one was used 1921-1936 to take freight from Whitehorse to Dawson City and this one was used 1937 to 1955. This sternwheeler was the largest and could hold 50% more freight than any others and still navigate the shallow waters of the Yukon River. 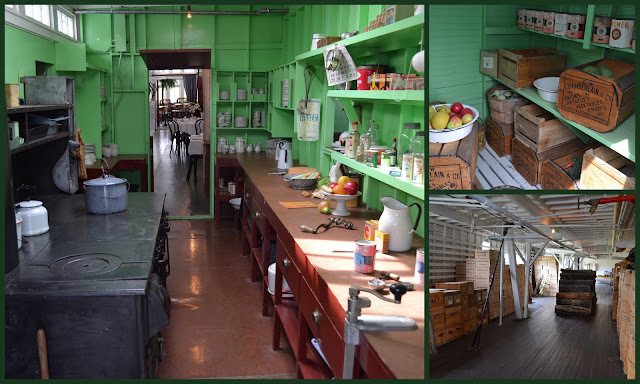 Once the highway connected Whitehorse to Dawson City, the SS Klondike was converted to a cruise ship in 1950, the dining room can be seen past the kitchen. It operated as such for five years, when lack of interest forced it to shut down. The huge copper nugget in front of the museum was mined in 1905. It weighs 1175 kg. (2590 lbs) making it Yukon’s largest nugget and likely the largest in Canadian records. Through several challenging obstacles over five days, it was moved here in 1958. It was dedicated to the many prospectors of White River county who staked claims between 1900-1958. All totem poles are story tellers but this one has a very amazing story to tell. The project included several carvers over a 20 week period. It is 11 metres (36 ft) high and was created to help former residential school students heal. Each wood chip during its construction was kept then signed by a former student or family member, each representing a life. When completed, the chips were burned and the ashes saved in a box and put inside the totem pole, this represented sending each child back to their mom. We took a walk along the Yukon River from the SS Klondike into downtown area which wanders through the area once called Whiskey Flats. It was known for the squatters and those who came in droves when the gold rush brought them and there were no homes for them to stay in. For several years there were hundreds of cabins, huts and shacks. In 1953 when Whitehorse became the Yukon capital, new development began. Due to the “unsuitable and unsightly” homes of Whiskey Flats, some were relocated but many were destroyed without owners consent. A riverside walk and park now borders the river where these homes once sat. Whitehorse is the city with the least air pollution in the WORLD according to the Guiness World of Records! That is quite something to be proud of, as is the Indigenous artwork seen in several places in the city. We've been thinking about going on a trip to the north and these blogs are giving us a ton of information.. the pictures and comments are awesome, thanks for sharing..
My pleasure, Diane! Great to hear it is being helpful to you and Bruce. So much to see and more to come.